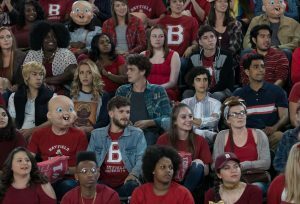 (third row from bottom, from left) Phi Vu as Ryan, Jessica Rothe as Tree Gelbman, Israel Broussard as Carter, Sarah Yarkin as Dre, and Suraj Sharma as Samar in HAPPY DEATH DAY 2U. ©Universal Studios. CR: Michele K. Short. The sequel, from Blumhouse and Universal Pictures, follows on the heels of the original, which became a surprise hit in 2017, raking in more than $125 million in worldwide box office receipts. Rothe, who starred in the 2016 MTV series “Mary + Jane” and had a supporting role in the Oscar-nominated “La La Land,” returns to the comedy-horror franchise as the protagonist Tree, a college student caught in a time loop, forced to replay her final day on Earth over and over again as she is stalked by a masked killer. In this sequel, she once again wakes up in her boyfriend’s bed, only to be stalked by the killer. This time, not only is she a target but her friends are as well. A few monkey wrenches are thrown in for good measure but Tree quickly is able to eliminate the person who turned out to be the killer in the original. So, who is after her this time around? After realizing she’s back in the horrific loop, Tree enlists a group of rogue science students to use their experimental inter-dimensional device to help her break free, before the killer attacks them all. Hampered by a the school’s dean (Steve Zissis) who wants to shut down the students’ unauthorized science project, Tree narrowly escapes through a portal to an alternate reality, which is similar to her own reality but also different. Her beau, Carter (Israel Broussard), is dating someone else, but on the other hand, someone she knew to be gone in her own reality is very much alive. Ultimately, Tree has to decide in whether to return to her own reality or stay in a similar yet different world that is not her own. Much of the original cast (Broussard, Ruby Modine, Phi Vu and Charles Aitken) are back as well as writer-director Christopher Landon. We caught up with Rothe, who recently completed production on the ‘80’s-set musical comedy “Valley Girl,” a remake of the 1983 Nicolas Cage-Deborah Foreman romantic comedy. Q: How much fun was it for you to come back to the Tree character in “Happy Death Day 2U?” A lot of times you don’t get to do that. Rothe: Yeah. It was so much fun and a huge part of that is I love Chris Landon, our writer-director so much. He is one of the most intelligent, kind, darkly hysterically funny human beings I’ve ever met. He has created this incredible world and this incredible character that I’ve had the good fortune to inhabit. Making the first film was such a joyous experience that when he pitched the idea of the second movie to me, I was like, “Wow, that sounds insane but if anyone can pull it off, it’s you.” So, going back was kind of like going back to summer camp. Everybody came back. Most of the crew came back for this as well. I was also really excited about the chance of exploring a totally different element of Tree’s personality because, in the first one, we watch her transform from this kind of snobby, bitchy sorority girl to badass and, in the second one, she starts out as a badass but then finds herself in a very difficult and emotionally wrought situation and she has to make some pretty big decisions. Q: You have most of the same cast, the same crew and and get to explore more of a character? Did you have a sense of deja vu? Rothe: Totally because we were back in New Orleans on a lot of our same sets and even the ones that were on stages, we might not be at the same stages but the bed was the same and the posters were the same and it was a huge sense of deja vu which only helped my characters because I was like, “I’m back and this is totally insane.” But, it was such a gift and such a joy. I’ve never returned to anything before. I’ve never been in a TV show that has gone for a second season so you go away and come back. There was a level of slight anxiety I had about it. I was thinking, “I hope I’m doing her justice. I hope I’m making decisions Tree would have made,” but the thing that’s so lovely about this movie is even though it is a loop and we’re returning, all of the situations Tree finds herself in are so different that there is freedom to behave differently. Q: Was there a lot of discussion about the logic in the film because you are talking about multi-dimensions and the character traveling from one to another. Did you have a lot of discussions with Chris about the little technical changes and the logic of going to another dimension? Rothe: Yeah. We talked about it a lot because we wanted to make sure it was something that scientifically was feasible and should there be two Ryans and two Trees? How does all of that work? The thing that was really cool is that Chris did a lot of research and found explanations for everything and because he talked through it all with me, I understood it and could get behind it and the storytelling of it. Not only that but all of the little Easter eggs that are hidden throughout the film like the graphics on the shirt being different. On the first shirt I’m wearing, it’s a concert in Texas and on the second one, it’s in New Orleans. So, it’s little changes like that for people who love to freeze frame movies, it’s gold. Q: Have you thought about what it would be like to pop into another version of your own reality? Where would you want to be and who would you want to see there? Who would you not want to see? Rothe: Exactly. When the movie “Sliding Doors” came out, it almost sent me into existential crisis because I think about that all the time. Like, “Wait. If I left my house five minutes later, maybe this would have happened and I’d be on this different track of my life. How would that affect me?” So, it’s definitely something I’ve thought about before. The thing that feels so nice is, right now, where I am in my life, 90 percent of what it is, I would want to go find those places and those people and things (if she were in another dimension or timeline) which I feel very fortunate saying because that’s not always the case. I’m really lucky to be surrounded by some pretty spectacular people and I have a super cute dog. So, I’d want to find the dog. Q: You mentioned having two Ryans and two Trees, so what was the logic of not having a Tree in the other reality? Rothe: There are a couple of things. It’s explained in the film but I can’t remember Ryan’s (Phi Vu) quote, “Oh, because it’s a quanti-cyclical dimension, instead of you going into a dimension where you existed, you almost body-hopped in a way. You almost took over the space of this person.” We talked about it. I wanted to have two Trees. “Let me play my double. I really want to.” Every actor wants to do that but we realized that it would cause a lot of problems because then Tree would either have to kill herself in order to be the only Tree which is very morally complicated and totally mind-bending or she’d have to deal with her (double) every single time or spend her entire time avoiding her and dealing with the repercussions of that. So, instead of serving the story and where we wanted the story to go, it would detract from some of it and the fact that Tree actually believed that this could be her life if she wanted it to be, such an important part of this story and this film is if you could just live a different version of your life, but once that meant you are kind of living in the past, do you choose that or do you take the heartache and the pain and take the person it’s molded you to be and move it to the future? Q: Will audiences need to have seen the original “Happy Death Day” to understand this one? Rothe: A big thing we tried to do with this one was make sure that people who had never seen the first one would watch it and enjoy it enough that they’d want to go back and watch the first one or just be total avid fans of the new one. The thing that’s incredible about this is that it takes a lot from the first film that was so wonderful and raises it up but also takes a completely different turn. I appreciate that because the last thing I ever want to do is make a film that is just a regurgitation of something I’ve done before. Unfortunately, some sequels can be that because they take things that work in it and just say, “Let’s do that over and over again.” Chris really didn’t allow us to do that. He upped the ante and brought in this whole sci-fi element. He answered questions that were left unanswered in the first film all the while keeping the heart and the moral complexity and the wonderful characters that we fell in love with in the first one. Q: Was it challenging to do the emotional scene with Tree’s mom? Rothe: It was really hard because I’m incredibly close with my mother. Chris and I talked a lot about the fact that you have an opportunity to film something that, one day, you’re going to look back on and feel differently about it. (She tears up). I get emotional just talking about it because it’s true. That’s one of the reasons I love this job is because I have the opportunity to do things like that. Honestly, I got in my own way at the beginning of the day because I was so worked up and I really wanted to do it right. I really wanted to do my mom the honor of expressing what that would mean to me and letting it mean that much and Chris had to sit me down and say, “You need to calm down because you are psyching yourself out.” The homework he gave me was, “Sit down and make a list about all the things you love about your mom,” so I actually have two pages of my script that just have all these notes. I have to give it to my mom at some point. So, it was definitely challenging and I’m so grateful to Chris and to the wonderful actress (Missy Yager) who plays my mother because her performance is so beautiful and nuanced and simple and she really was there for me and present. But, yeah, it was hard but rewarding. I feel that it’s such a unique opportunity to get to say the things that people always wish they had said. Q: I have to commend you on your physical performance in this. I know you had a stunt double for some of the stunts, but is that you running up the stairs with your hands behind your back? Q: Next, you have the “Valley Girl” remake. What’s the status of that film? Rothe: We shot it. It’s all done. They’re just looking for the right release date which is really exciting. I got to wear some unbelievable ‘80’s clothes, lots of shoulder pads, lots and lots of big hair and she’s such a different character from Tree because (“Valley Girl’s) Julie is so curious and in love. There is no snark to her at all so there is this very different energy and I had a really fun time working on that. Q: Was it fun to visit the ‘80’s? Did you keep any of the period outfits? Q: Do you get to do a lot of singing? Rothe: I do. It’s like a juke box musical. We get to sing “’We Got the Beat.” (Co-star) Ashleigh Murray does an amazing cover of “Girls Just Wanna Have Fun.” Josh Whitehouse sings “Crazy for You.” We get to sing “Melt with You” together. That’s kind of the love theme that’s woven throughout the film which was also really fun because that song, the original “Valley Girl” movie was its break. Back in the good ole days you would watch a movie and artists would release their songs in a film. Previous PostPhotos: ‘Nobody’s Fool,’ More on Home Entertainment … Plus Giveaways!! !